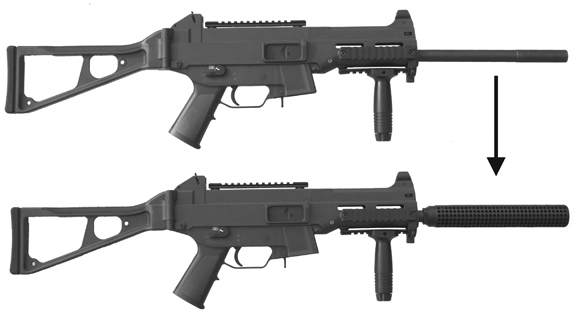 Designed specifically to fit the HK USC-45 Carbine (UMP). We test all our Fake Silencers to be 100% sure that they function shot after shot without any problems. This Version of the MFI HK USC-45 M4 Fake Silencer is Marked with the Logo of the "KaMPFSWIMMER". The Kampfswimmers are the Ultra Elite Combat Swimmers / Frogmen of the German Special Forces. Kampfswimmer Unit 3402 is the equivalent of the US NAVY SEALs. This product fits ONLY the HK USC 45. The above photos shows the MFI M4 Fake Silencer for the Heckler and Koch (HK) USC45 Carbine to give the look of a suppressed H&K UMP 45 submachine gun. MFI has produced a legal version of the M4 Knights Armament Silencer (to meet current BATF specifications for a Fake Silencer / Non-Functional / Cosmetic Only ) here in the USA. MFI has been a Class II BAFT 07 Manufacturer + SOT & a DOD / Military Contractor so we have access to the real thing here to take measurements off of to assure as close a match as possible. The only areas where we deviate from the original in, is that the Depth of the holes are deeper to reduce weight and add a greater 3D effect and the lettering is changed slightly so as not to violate Knights Armament Intellectual Property Rights. All MFI Barrel Shrouds / Fake Silencer / Mock Suppressors / Faux Silencers are 100% Cosmetic & have ZERO Function. Unlike true vented barrel shrouds / heat shields our products make NO CLAIM to any protection from heat that is generated from the barrel. As you fire, your barrel will heat up and that heat is directly transferred to the MFI Product. Therefore you should NEVER grab hold of the MFI Product if you have fired more than 5 rounds, as you WILL burn your hands. The MFI M4 & SOCOM Style Fake Silencers do NOT reduce muzzle noise or muzzle flash in any way. So these are to the best of our knowledge 100% legal for the regular civilian to own in all 50 US States. Obviously it would be impossible for any manufacturer to know every law / regulation / ordinance of every Country, State, County, City or Town on the planet. For this reason you the customer are required to research this issue to be sure you are within the laws of your specific location. MFI is NOT liable for any item purchased that violates any law(s) or regulation(s) anywhere on the planet. One would think that common sense would be a good guide line for any issue, but as the US Federal Government lacks any sense of this we are forced to make statements like this. When MFI is informed of a State's, County's, City's or Town's specific law / regulation / ordinance we will post it here for all to see. We require a copy of the exact wording to verify the validity of the claim. Fits only H&K USC 45 Carbine. Maximum Outer Diameter: = 37.9mm or 1.495 inches. Maximum Inner Diameter: = 20.70mm or 0.815 inches. Maximum Length: = 235mm or 9.25 inches. Weight: 11.2 ounces or 320 grams! Available UNMARKED so that you can have your engraver mark it any way you like. The MFI M4 Style Fake Silencer does NOT reduce muzzle noise or muzzle flash in any way. So these are 100% legal for the regular civilian to own in all 50 US States. The HK USC45 M4 Fake Silencer / Barrel Shroud fits the H&K USC-45 Carbines WITHOUT ANY MODIFICATION. The HK USC 45 M4 Fake Silencer slides over your barrel and is held on by 4 nylon tipped set screws. The nylon tipped set screws will not dent your barrel as much as the steel tipped set screws do. This is High Temperature Nylon so they will NOT melt. If you want steel tipped set screws all you have to do is pull the nylon tips off. Sliding anything over your barrel or using any type of set screw WILL leave a mark. If your are worried about marking or scratching your barrel, this product is NOT for you. You can index / position the laser engraving any where you like as the rotation of the outer body is stabilized / stopped by the set screws that makes contact with the hidden barrel.